Cheryl’s Shoebox is dedicated to assist those within our community in need. Mexico’s government estimates that 33% of Mexico’s population lives in moderate poverty and 9% lives in extreme poverty. Cheryl’s Shoebox is available to assist families or persons in need by supplying shoes to help lessen the burden. We will be working with Firefighters in Puerto Vallarta as well as other emergency services so that we can be notified where help is needed. In 2015 Cheryl’s Shoebox was able to supply 200 pairs of shoes to victims of Hurricane Patricia that left many south of Puerto Vallarta homeless and in need. After-school programs are located in several communities where drugs, alcohol and poverty are on going problems. Some children quit going to school in their early teens because of the poverty. The after-school program includes a hot meal, English classes, and help with schoolwork. These after-school programs also bring in professionals (e.g. firefighters, police and nurses) to speak with the children. The positive effect on the children is great and worthy of all the support we can give to assist these programs. Cheryl’s Shoebox has already worked with the colonia of El Colorado in 2015 supplying 70 School shoes and looking forward to expanding our reach to Colonias Progreso, Lomas de Enmedio & El Salitrillo in the fall of 2016. The Benito Juárez school is located in the fishing village of Chimo isolated in the southern section of Banderas Bay. As with many schools in outlying areas there is little government support. Cheryl’s shoebox first visited the school in 2015 and supplied all students with school shoes for the year. The school consists of 70 children attending all grades from kindergarten through to junior high. In 2016 Cheryl’s Shoebox will once again supply shoes however, we know we can do more. Cheryl’s Shoebox will work with the school director to assess the needs of the school and students. Cheryl’s shoebox is one of the many organizations that come together Christmas morning to distribute toys, clothing, diapers, blankets, non-perishable food and of course shoes. January the 6th is a special day in Mexico. Known as ‘El Dia de Reyes’ (Three Kings Day), this holiday represents the height of the Christmas season. The date marks the culmination of the twelve days of Christmas and commemorates the three wise men that traveled from afar, bearing gifts for the infant baby Jesus. The children of Mexico in particular look forward to this holiday as traditionally, gifts are exchanged on this date. Cheryl’s shoebox has been donating shoes to various organizations that spread out around Banderas Bay each year to bring toys to the children. It is a great feeling when people reach out to Cheryl’s Shoebox for assistance and we are able to help. We are working with “Brighter Future Building Communities” to supply migrant farm workers and their families working in and around Punte Perala with shoes, soccer balls, and clothing. This year Cheryl’s Shoebox donated 43 pairs of custom fit new Huaraches (sturdy leather work shoes) and about 50 pairs of used shoes. Freda Thompson donated new clothing and soccer balls and Tammy Carruthers Prust from Nacho Daddy Restaurant supplied new underwear and clothing. On December 18, 2014 the shelter began offering its services to women and their children who are victims of domestic violence. Banderas Bay Women’s Shelter is one of very few shelters in Mexico. Cheryl’s shoebox contributes to many local Christmas programs run by various other charities in Puerto Vallarta. A program that has brought Christmas to Quimixto since 1979, Cheryl’s Shoebox has been assisting with the Quimixto Christmas Program since our very first year. 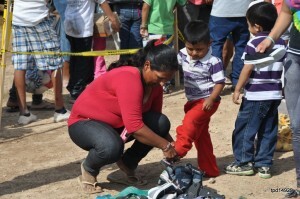 Yearly, we supply the school children with shoes during the Kings Day celebration held on January 7th. The program does not only include Christmas and toys but also has grown to include year round programs including school supplies, clothing, hygiene items, food and more. Scholarships via the BECAS Organization (http://becasvallarta.com) are provided to the children of Quimixto so that they can continue their education into Secondary Schooling. 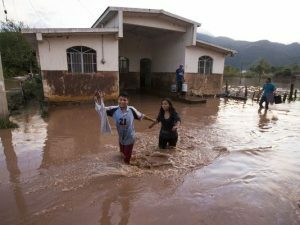 Money and supplies are also donated to the mini medical center in Quimixto and to the new Medical/Dental Center in Boca de Tomatlan.